On Wednesday, September 16, Premier Christy Clark and Vancouver Mayor Gregor Robertson joined the Vancouver Police Department and the Vancouver Police Foundation at the Night Patrol Gala 2015 to pay special tribute to Jim and Vicki Chu for their 65 years of service with the Vancouver Police Department. The Night Patrol Gala sold out weeks in advance, with a guest list that included the city’s most philanthropic and illustrious personalities. Approximately 1,400 attendees were treated to an exhilarating and experiential Vancouver Police Patrol experience. 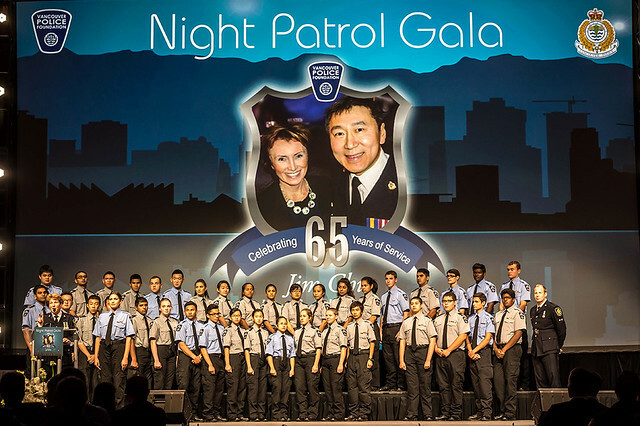 The evening, co-chaired by Peter and Joanne Brown, and Ryan and Cindy Beedie, raised more than $1,660,000 in support of the VPD Cadet Program, an impactful program for youth at risk. It is one of many legacies Jim Chu has contributed to the City of Vancouver. “It is impossible to be a great city without a great police force. Jim and Vicki Chu have given the necessary commitment and have made the required sacrifices to leave us with the best,” said VPF Chairman Peter Brown. The Cadet Program is not funded under the police department’s operating budget. The funding comes entirely from donations. Tricor Pacific Founders Capital Inc.